If you have a young child or older kids, fishing is a great way to get them outdoors and there are plenty of activities you can do to keep them busy as they learn how to fish. Casting a fishing rod, holding it and winding in a fish are skills which require concentration so fishing is a great way to get outdoors and it also teaches hand-eye coordination, patience as well as learning about our environment and how to care for it. Sometimes keeping hooks baited and on the bottom where they need to be can be a challenge for a child that just wants to wind. A great way to keep children active is by using lures and soft plastics, which are like imitation fish with a hook in them (see lures). Kids naturally want to wind and cast so lures are the prefect solution and it also helps them improve their casting. A good option might be to leave one rod with bait on it and put a lure on another rod. That way they can practice their casting and retrieving and have a good opportunity to catch a fish at the same time. It is not always about what they catch, it is the whole experience about putting a rod in the water and exploring and discovering the world around them. Children learn so much more from being physically active, touching and exploring for themselves rather than reading it in a book or watching it on television. Young children are easily distracted and after 20 minutes they may have had enough fishing so think about other activities you can do. Bring a bucket and little scoop net so they can wade the shallows and catch anything they please from seaweed to baitfish, or jellyfish (non-poisonous ones). Our kid’s love watching baitfish swim around in a bucket of water and then they carefully release them back into the water. When they get tired of that, they sometimes fill the bucket with sand or collect anything from shells, to bottle tops and treasures they find along the way. 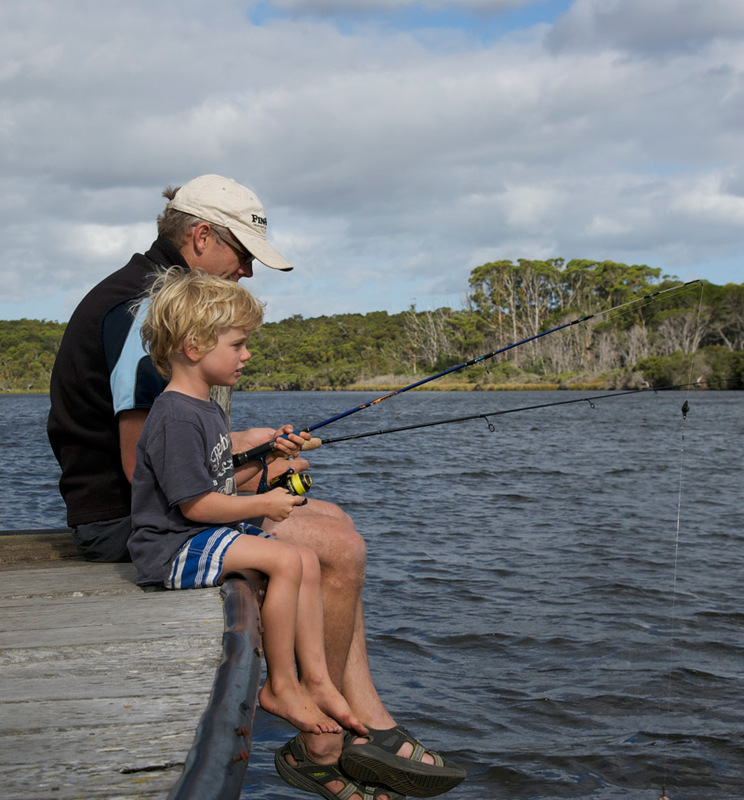 Make your fishing trips an adventure, involve the kids in the planning and get them to think about where they want to go or what sort of fish they might like to catch. Be sure to take a camera, as there will be plenty of great photo opportunities you won't want to miss. It does get easier with older children as they are generally more responsible and can assist in the decision-making process. They may have an idea on where they would like to fish, what type of fish they would like to catch or how they want to fish (with bait or lures). The more they fish, the more they will learn about the different techniques, such as lure fishing and will be old enough to help prepare and maybe even bait their own hooks and release their own fish. If they have never fished before, then read the how to section and remember to be patient and encouraging. Even though they are older, this will all be new to them and they don’t want to feel insecure or that they can't do it. If they can tie their own shoelaces then they have already mastered a couple of knots. This is a good time to teach them a basic fishing knot and who knows, you might be able to learn it together (see knots). They can then use this knot to tie on their hook and rig. The same goes for putting on bait and releasing fish. The more they do it, the better they will get at it and not only will they be proud of themselves, it also helps them to be more independent and less reliable on you doing it for them.